Troubled starlet Lindsay Lohan's career is "only going up,up,up"
The troubled actress - whose career has floundered amid a series of legal problems and spells in rehab - insists she is putting her bad times behind her and is focused on getting her life back on track. Responding to a twitter follower who described her as "forever my childhood crush", she posted: "omg! really? that's so cool hahaha thank you xoxo - sorry for the ups and downs... only going up up up from here! "i'm a tough cookie! a focused tough cookie! :) (sic)"
Lindsay - who is currently undergoing community service at the Los Angeles County Morgue as part of her punishment for breaching probation - also revealed she has gotten into a regular routine to be prepared for her unpaid work, and has cut down on her use of social networking websites in order to tackle domestic tasks at home. "i'm only on [twitter] for quick moments at a time lol... i'm actually cleaning - was at community service all day (sic)". 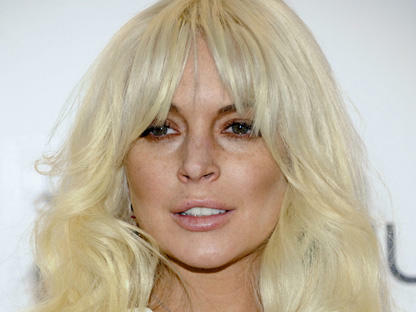 Lindsay's positive attitude comes as she was praised by Los Angeles County Superior Court Judge Stephanie Sautner, who told her she seems to be getting her "life back on track" during a progress hearing on Wednesday. The 'Mean Girls' star has 14 more days of community service and five counseling sessions to complete before March 29, and then her probation will be over.